Read-out Instrumentation Signpost: Efficient connections for the Ex zone. In environments where there is a high explosion risk (known as Ex zones), connectors must fulfil special safety requirements. Here Howard Forryan of Harting discusses how these challenges may be met. Harting offers a range of connectors - the Han® Ex series - that meet the safety requirements for ignition protection in Ex zones 1 and 2. The use of such connectors, featuring innovative termination techniques supporting unskilled assembly and flexible hood and housing mating solutions, allows end users and installers more installed site flexibility and keeps costs down through time saving in various hazardous application areas including process automation in the petrochemical, chemical and mining sectors. Operators of oil and gas platforms need to continuously monitor their sites’ ambient condition status through parameters such as gas concentration levels, differential pressures and temperatures. Mobile explosion-proof detectors and transmitters allow such measurements to be made at various different key locations on the platform and then be re-positioned as required. The readings from these instruments are switched and recorded via an explosion-proof central controller. These pre-existing detectors and central controller enclosures will typically already have glanded conduit access points. Because of the stringent requirements of explosion-proof equipment, users need to avoid making any modifications to such certified equipment. 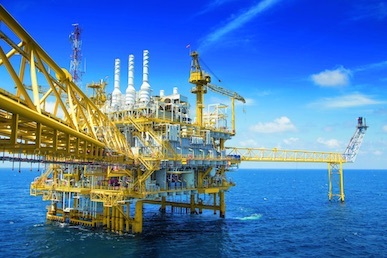 In order to save valuable installation time and to maximise location flexibility of such a mobile detection system onto an oil or gas platform installation, Harting offers an exposion-proof connection solution with the compact Han® Ex 4A cable-to-cable connector system, a product that can be retrofitted without compromising the equipment’s Ex certification compliance. Because all detectors are provided with pre-fitted connector cable ends, they are supplied to site fully pre-tested, which ensures fast pluggable installation. For the links to the central controller enclosure already located on site, cables can be wired through existing glands and conduits, leaving free ends for cable-to-cable connector termination. 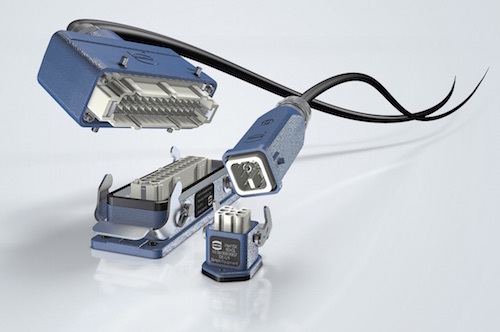 Harting provides its mating cable-to-cable connector with tool-less quick-lock termination connector inserts, allowing for quick and simple non-specialist wiring on-site installation. The application of the Han® Ex 4A cable-to-cable connector system allows the connection between the controller and the detectors to be made outside the explosion-proof enclosure, hence ensuring that there is no modification done to the enclosure and no need for re-certification of equipment. Another offshore oil and gas platform related application where connectors offer significant benefits over hard-wiring is on mobile heavy lifting cranes, which may need to be frequently removed and re-installed at different locations. While the crane platform and operator cabin are installed in the so called “safe zone”, the boom is operating in the hazardous zone, thus making it mandatory to use ATEX approved components. The boom carries a number of different sensors (for detecting angle and load, for example) and a light bar at its tip; near the cabin various connectors are used at a panel where all the sensors are wired up. Across the general “Ex” sector, the replacement of defective loads such as low-voltage switchgear, generators or pumps is complex: the power has to be switched off before the defective equipment can be uninstalled and replaced. With a hard-wired installation, all cores would have to be screwed or connected individually. Connectors, on the other hand, reduce downtime and support modern and flexible machine configuration through modularisation in hazardous areas. Harting’s Han® Ex series connectors are available in different tool-less contact wiring termination designs, so that no specialist skilled personnel are needed for initial assembly and replacement of components. Similarly, the installers require no special tools, thereby accelerating the switch-out operation while maintaining all safety functions. Crimp termination is also an option for the volume OEM manufacturing producer. Intrinsically safe explosion protection is based on the limitation of the power circulating in intrinsic circuits, permitting electrical devices to be operated safely even in an explosive environment. Han® Ex connectors meet the standards for materials that are permitted to be used in potentially explosive atmospheres (DIN EN 60 079-0). Air clearance and material creepage distances are in accordance with the intrinsically safe circuit requirements for zones 1 and 2. Their blue colour provides easy identification of inherently safe circuits and they ensure protection class IP65 when mated or unmated in conjunction with appropriate lanyard attachable loose covers (plastic for Han® Ex B and powder coated blue zinc die-cast for Han® Ex 3A series).